Preheat oven to 230°C/450°F. Put cast iron pan to the oven and preheat for approx. 10 min. In a large bowl, whisk cornmeal with buttermilk and set aside. Add half of the sweet corn kernels to a food processor and puree until smooth. Transfer pureed corn to a small pot and let cook over medium-high heat for approx. 5 min., stirring often. Remove from heat and set aside. Add oil to the preheated cast iron pan and put it back into the oven for approx. 5 min., or until the oil just starts to smoke. Remove pan from oven, add butter and carefully turn pan until butter is melted. Add two thirds of the butter-oil mixture from the pan to the cornmeal-buttermilk mixture, keeping the remaining butter-oil mixture in the pan. Add pureed corn kernels, remaining corn kernels, eggs, baking powder, baking soda, and salt to the bowl and whisk until just combined. Transfer cornmeal batter to the hot pan and bake at 230°C/450°F for approx. 20 min., or until the edges turn golden brown and the surface starts to crack. Remove from oven and let cool in the skillet. In the meantime, beat remaining butter with honey. Transfer to a serving bowl and sprinkle with fleur de sel. 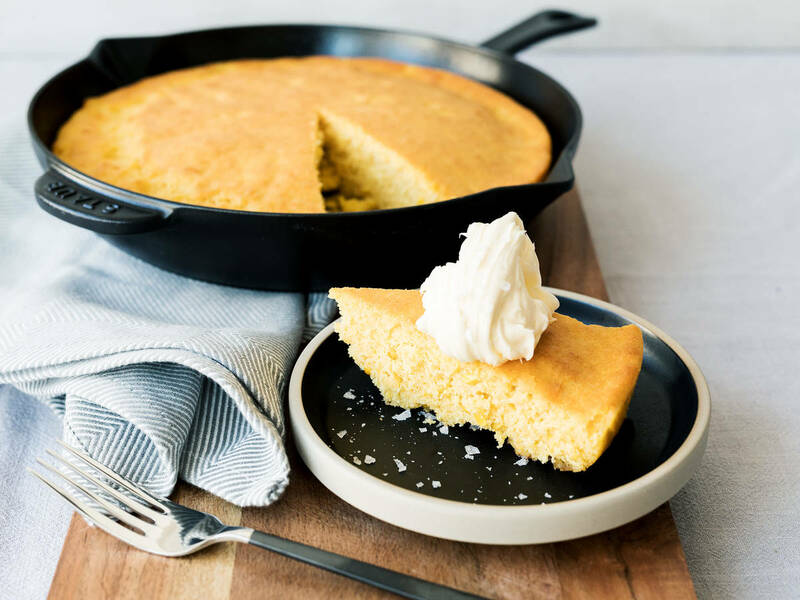 Slice cooled cornbread and serve with honey butter. Sprinkle with more fleur de sel to taste, and enjoy!